At the moment we´re working on new songs for the sixth studio album that´ll hopefully pop up somewhere around...well, let´s hope for at least early next year! In the meantime you can lay your hands on some brand new Hearse merchandise! We can now present a strictly limited edition of 25 pieces very cool band logo patches (measurements 13 x 7 cm). 1 piece costs 5 Euros incl. shipping and packaging within Europe. For third country orders we have to figure out a special deal then. This edition is limited and when we say “limited” we mean it! There won´t be further units made! Then we will let you know if you are the lucky 1 out of 25 people. After receipt of your email we will inform you about the further procedure to conclude your order. Alrighty, the new album SINGLE TICKET TO PARADISE is out there for you to lay your hands on! For money you can actually get a CD with 9 new songs mixed by Dan Swanö (Edge of Sanity, Bloodbath etc. ), and as if that wasn´t enough you will also get a bonus DVD featuring Hearse on stage recorded live in Holland a couple of years ago. The DVD is edited by Maurice (Legion of the Damned) and he has done a super duper job if you ask me! If you can not find it in your local shop you always have CDON, Ginza or for example Amazon. Another option is to order it directly here. Hmmm…I tend to forget that Hearse also has this site nowadays. I use to update the MySpace site quite often, but this one...sorry! Anyway, here we go with the latest news! Hearse´s 5th album Single Ticket to Paradise will be released on the 5th of May! It´s 9 songs long and also comes with a bonus DVD containing Hearse live in Holland 2004! I am quite eager to see it myself actually as I still haven´t seen it! It´s all filmed and edited by Maurice (vocalist of the super duper great band Legion of the Damned) and his Low Life Media. Then I´m pretty sure that Vic (our label) will put it our brand new video clip for the song Sundown there too! So I guess it´ll be a pretty good value for the money release! So remember: 090504 is the date, folks! For more info check out Vic Records site! Check out new pics from the new album recording at the pictures section! Alrighty! Hearse just signed a new record deal with Vic Records! It feels just great! Vic´s a cool label and there´s a lot of cool bands on the label. Getting mails from the label boss saying things like “I am having a total Hearse trip these days! Really! Only listening to your albums..... These bonus tracks on the Cambodia album are sooooooooo damn good!!!! !” doesn´t really make it feel like a bad decision either! As told Hearse is right now working on the band´s 5th album. For more info check in here now and then and don´t forget to check out www.vicrecords.com ! Finally something to report from the Hearse camp! Yup, the band has begun the recording of the fifth album. So far the drums has been recorded. 12 songs are planned to be recorded and most likely 10 of them will end up on the album. As soon as we get green light from our record label (depending on which one it´ll be) the recording will continue. More info on the recording to follow. In the meantime check out some pics from the recording here. IN THESE VEINS is now also available in the States! So all you Americans, go get it! For more info check out Candlelight Records USA! Alrighty, finally a sign of life on this site! Seems like we´ve been hangin´ out too much on myspace.com instead of being here! Anyway, we´ve now filled the pics section with some new pics and there´s also a bunch of new quotes concerning our latest album IN THESE VEINS. By the way we just got the release date for USA and Canada; Sept 18 it is! Out through Candlelight USA! Right now we´re planning for album no.5. 15 songs are pretty much finished and a pre-production has been made in the now legendary Stockholm situated Studio Gubbsjuk. As soon as we get a recording budget we´ll begin recording the album! 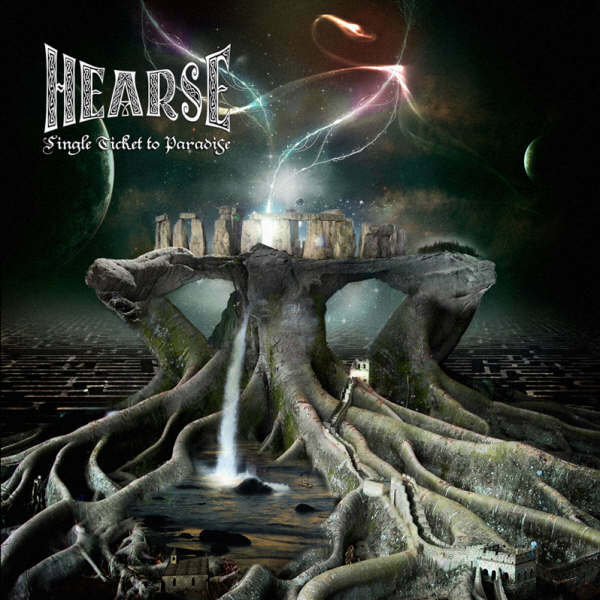 HEARSE´S 4TH ALBUM IN THESE VEINS IS NOW AVAILABLE IN SCANDINAVIA. FOR RELEASE DATES FOR JAPAN, USA AND EUROPE, STAY TUNED! Go visit www.dentalrecords.se for a little taste of the new album! Check out Hearse playing "Intoxication" from the new album at the UP FROM THE GROUND FESTIVAL! Go to the "Discography" section to download it! Hmmm…first Regain Records, then Cold Records and now…Dental Records. Is Dental the final destination? We ain´t got a clue, but it sure seems so right now. It also sems like the new album will be out in October. Let´s hope for that! For more information and to get a spot of the cover art, visit Dental Records homepage. Click here! We´ve just played the UP FROM THE GROUND festival in Germany and we hd a blast over there! Great to see all friends from all over and great to finally play again. We aren´t exactually playing our asses off so to speak! So thanx to everybody that showed up when we played and thanx a lot to Heiko and all other dudes behind UFTG! The 4th Hearse album entitled ”IN THESE VEINS” is now recorded and mixed. Dan Swanö (Edge of Sanity etc. ), who mixed rackaren, did a great job as expected. This is definitely the best sounding Hearse album so far. Dan had pretty much free hands and gave the recording quite a rough touch even though it sounds much more modern than our earlier albums. Some song titles for the album (that´ll contain 9 songs) are: Corroding armour, Among the forlorn and In these veins. The album will also contain an old Swedish classic song from one of our old faves. As soon as we have a release date it´ll pop up on the site! Stay tuned! Johan just finished his vocals for the new album. Jugga from the old Swedish gubbmangel band Mob 47 also came by the studio to do some screaming. Turned out just great! So now it´s up to Dan Swanö (Edge of Sanity etc.) to give the production a touch of heaviness och pure dirt! Check out all the pics from the recording at the “Pictures” section! Now there´s a bunch of new photos from the new album recording up on the site. Visit the “pictures section” to check them out! More photos will be added as soon as Johan has been to the studio to do the vocals. Alrighty, the music for 11 songs has been recorded. Now we´re just waiting for that longhaired skåning Johan to come up to Stockholm to do the vocals. There will soon be some pics up on the site from the recording sessions, so stay tuned!